with 40 Mariner Outboard Motor and Trailer. Asking $1,500. Call 434-724-2161. 19' Long, Less than 50 Hours, Used maybe 4-5 times. 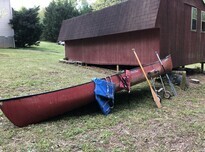 Call for Price, 336-939-3995.
with 2 Paddles, 2 Life Jackets, and a Pull Cart. Asking $450. Call 434-688-2211. Boat, 14-15' Length, 15-25 HP Motor. Call 434-425-2534 or 434-483-7615.